If you feel sometimes like mechanisms in carbonyl chemistry keep repeating themselves, you aren’t just imagining things. The fact is that there IS a lot of repetition. This has been covered before – the PAPED mechanism is at the core of a lot of important carbonyl reactions, but this time I’ve put a whole bunch of reactions of carbonyl compounds on one page and represented them graphically. I love these summary sheets! Thank you! 2nd column, top reaction, one C is missing from the product! Fixed. Thanks for pointing it out! The generalizability of organic reaction mechanisms really is staggering. Getting students to buy into it is the hard part! also it looks like on the imine formation that you have created matter with the extra carbon in the product end. You are correct… thanks for the spot. Fixed. think i found another issue in the claisen condensation. looks like there are some missing steps. it looks fine, but it is actually a 5 step process i believe. 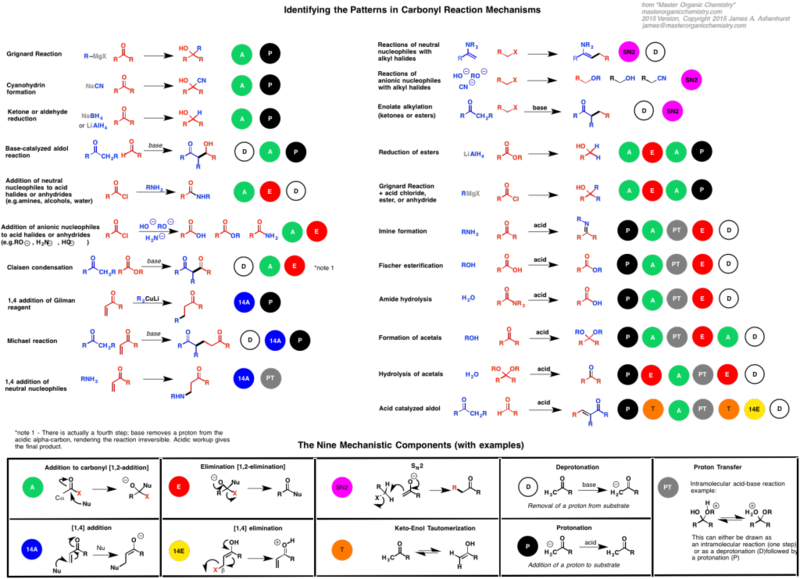 the solvent is left as an ion in this charts case… it should actually steal a hydrogen from the main body for the conjugate base to be satisfied and then the main molecule needs to be protonated via acid. at least it’s what i remember. Thanks Clayton: technically, that is true: the product B-keto ester quite acidic, and base will deprotonate it to give the enolate, which is its resting state until workup. It was a judgement call as to whether to include that level of detail in the sheet; I chose to try to relate the simplest version, which captures the essential details. Any chance you could put this up as a pdf? It is! you just need to go to File–> Save As. Thanks a lot!! These summaries are absolutely fabulous! !